Portable BeeBEEP mixes chat and file sharing tools with carefully-thought security features to deliver a reliable LAN messenger fit for everyone. It bundles the benefits of other popular messaging applications and provides AES-encrypted peer-to-peer communication, which makes it a good option if you are looking for a feature-rich yet cost-free solution. 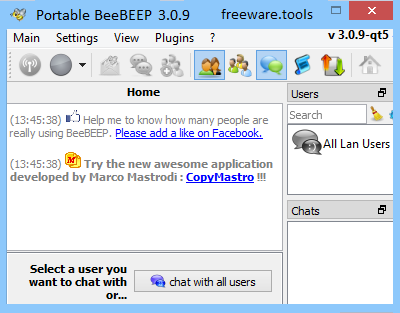 Portable BeeBEEP is an open source, peer to peer, lan messenger developed by Marco Mastroddi. You can talk and share files with all the people inside your local area network such of an office, home or internet cafe. You don't need a server, just download, unzip and start it. You do not have to go through an installation process for the application to work. Suffice to extract the contents of the downloaded archive and launch the executable file. The main window provides one-click access to all the opened conversations, the list of users, and the chat groups. You can either talk to everyone in the network or start a new private conversation with any of the online users. The chat window looks quite familiar so you are sure to easily get used to the application. You can send text messages and clickable links to your interlocutor, and enrich your conversations with more emoticons than you will ever need. For your convenience, Portable BeeBEEP can remember preset messages that can be then inserted with a single click. The text appearance is completely customizable, and so is the background color. Messages within the chat can be filtered for a cleaner view. Aside from simple text messages, Portable BeeBEEP also enables you to send files, or even entire folders to your friends. Images you send are previewed within the chat window. If you trust the sender, you can configure Portable BeeBEEP to automatically accept file transfers. Otherwise, you will be asked for confirmation each time a new file is sent to you. As a plus, Portable BeeBEEP features an integrated screen capturing tool that enables you to take snapshots of your entire desktop and then share them with your peer. Unfortunately, it's not possible to capture a desktop area or an opened window. You can leave Portable BeeBEEP opened and set a status, just like you would in any other chat app. If you disconnect from your profile, Portable BeeBEEP will display all the offline messages the first time you log in again. Conversations can be saved to a file, which means you can create and update a message history. Considering the above, it's safe to say that Portable BeeBEEP is a feature-rich chat client. Ease of use is one of its strong points but, more importantly, the application emphasizes on privacy and data security. All in all, it is a reliable LAN messaging client that is definitely worth a try, especially since it requires no setup.